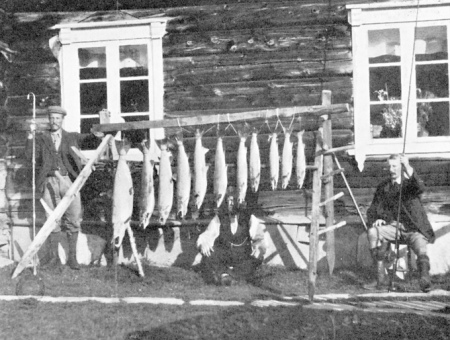 As early as 1440, there were written reports about salmon fishing in the Gaula. The salmon fishing rights were used for validation of properties. Custom papers dating back to 1571 show that there has long been a lively export of smoked and salted salmon from Trondheim to Denmark and Holland. 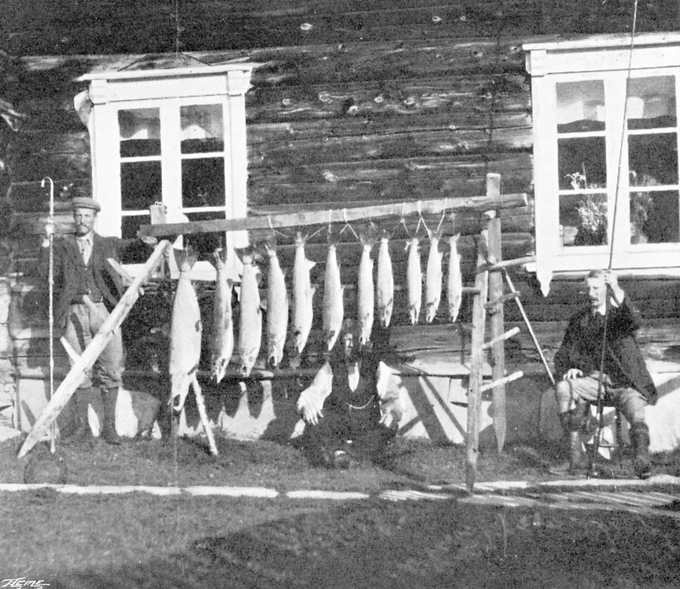 A lot of different equipment like nets, spears and the like was used during those days to catch salmon. Fishing with rod and line is known to have been in use a long way back in time but did not really become important before 1825 when the first English fishers with greenheart fly rods, silk lines and salmon flies laid the foundations for sport fishing for salmon on the Gaula. Some travelled by boat to Kristiania (now Oslo) and were using coach and horses to get up to Støren and the Støren Hotell, the center of the Gaula valley, crossing the Dovre Mountains on their way. Most of them came by boat to Trondheim and from there they had only a short journey to the valley of the Gaula. After the railway from Oslo to Trondheim was built in 1864, and the railway line from Trondheim to Röros was established in 1877, it was easier to access different parts of the Gaula valley. In 1835, Mr. Andrews and other English fishers stayed and fished around Støren. At a farm up stream of Støren an English House was built on the riverbank in 1837, after English fishers had been fishing there for some years. The lease on this water, which includes the original and now fully-renovated English House, is held today by the Norwegian Flyfishers Club (NFC) and is a cozy place for small parties to stay. The NFC has many other leases of beautiful fly water along the course of the Gaula, which has been known from historic times and is fished nowadays by some of the most passionate English flyfishers.